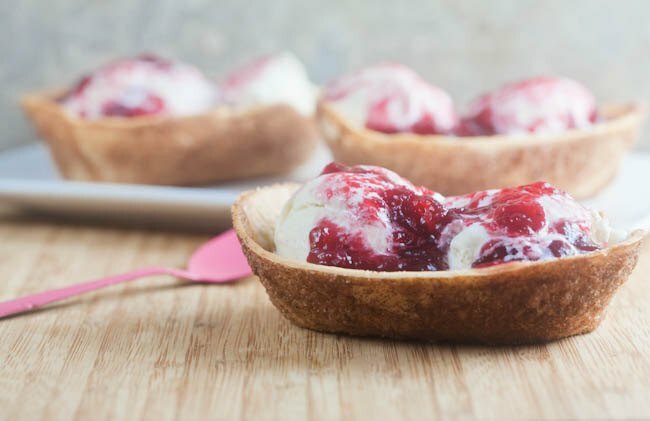 Cinnamon Cranberry Dessert Tacos | Healthy. Delicious. Are you looking for ways to use leftover cranberry sauce after Thanksgiving? 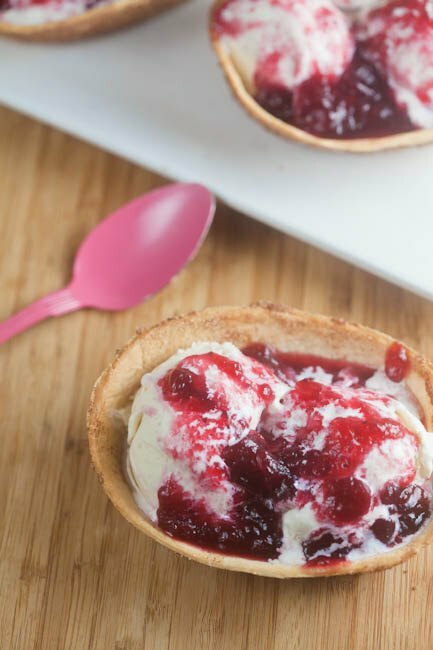 Repurpose it by making a sweet-tart topping for the cinnamon cranberry dessert tacos! For the edible bowls, I was inspired to do a twist on sopapillas, one of my favorite desserts. I brushed the tortillas with melted butter and sprinkled them with cinnamon-sugar, then baked them until they were crisp. Baking the tortillas takes away the raw flour taste and makes them more dessert-y. It also gives them a little more structure, so they can hold the ice cream better. Then, I mixed up a quick topping using canned cranberry sauce. You can use a fresh can of sauce for this, or repurpose any that you have left over after your Thanksgiving dinner. I sweetened the cranberries with a little honey (another traditional component of sopapillas) and a touch of vanilla. I absolutely loved the sweet-tart sauce over vanilla bean ice cream. It reminded me of a grown-up take on a classic sundae. In a small bowl, combine sugar and cinnamon. Brush outside of tortillas with melted better. ; sprinkle with cinnamon-sugar, covering the tortillas completely. (Discard any extra cinnamon-sugar or reserve it for another use.) Arrange the tortillas on a baking sheet and bake for 10 minutes, or until the top edge begins to brown. The tortillas will still be soft when you take them out of the oven, but they’ll crisp up as they cool. Let cool completely. In a small saucepan, heat the cranberry sauce over low heat. Stir in the honey, vanilla, and two tablespoons water. Let cool. To serve, scoop two small scoops of ice cream into each tortilla cup. Top with cranberry sauce. This post was sponsored by Old El Paso. Thank you for supporting the brands that keep me inspired in the kitchen. I am definitely going to try this for Christmas dinner dessert. I bought cranberry sauce for Thanksgiving and forgot to put it out! Lol. Now I have 4 cans of cranberry sauce that I want to use. Great idea! 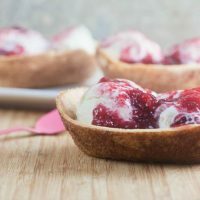 These dessert tacos are so fun! I love how they still have the flavors of the holiday season while also being a little out there! You had me at dessert taco! These look incredible! This sounds like a GREAT way to use up leftover cranberry sauce. 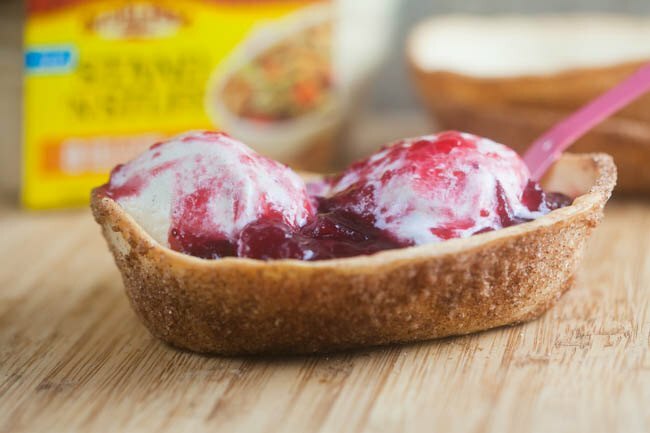 I have sooooo many cranberries in my fridge right now, so I may need to try this!